This was a local "Southern Highlands" car for a few years. so this car was prolly crushed? I hope this car did not get crushed. That would be capital sin. Even if the owner did not care about it, give it away to a Datsun enthusiast...but to crush it???? that looks INFINITELY better than the the square guages that "The Defect" has! Yes, this is a true and factory dash for the PB210 with the L16 and L18 motors. I/ve seen it in japanesse catalogs, also in the year car book by the "Italian asociation of automobiles", year 1974. Round gages are much nicer, I agree, the steering wheel is the same as my factory B210 (76) in US, the only difference is the center cap, which mine has a "D" as opposed to the GX emblem. I tried to get a dash like that for a while, no need to tell how unsuccessfull I was. Perhaps that car has the 4 round tailight conformation. Hy Dodgeman, that seems the case, I've noticed that the Japanesse used several differnt combinations when sending their cars around the world. I never thought that the round gauges would come in regular GX's w/no L series motors, but, we just saw another prove that when it comes , at least, to Datsuns, expect the unexpected. So I should asume this 120Y has the regular long low tailights, right? Confusing, but interesting, I like it. Click on the Photo Album menu item & scroll down to see pictures of the outsidr of this one, including the rear. HY. I just saw those pixes. The rear looks like the japanesse version , a while ago a Japanesse 120Y fan send me a couple pixes(Masayuki), his broder got a red PB210 , w/L engine, Masayuki's was a green A12 or A14 engined Sunny, with that same Sunny badge, and the same rear black panel, not flat, but with those horizontal groves.I think Masayuki said his was a B210 Sunny in Japan, the red one , with round tail lights was the pb210. so's the instrument cluster.the square guages of a 120y coupe are awful.these look very usable.are the 3 guages in the 'radio' position stock,cause they look factory to me. 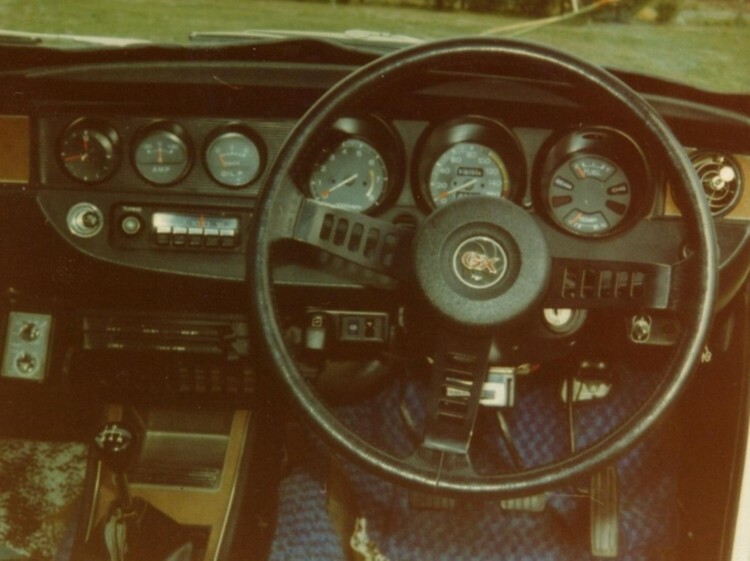 I believe that the 3 instruments are original because the rest of the car was completely unmolested &, if you squint a bit, you can see the radio just below them. why didnt the 120y GX come with the 5speed? or is that just a 4speed gear knob? The 120Y DID come with a 5 speed & i have one in my 1000 sedan, but it was an "OPTION". This one didn't have it & i believe that the gear knob is the original. If i remember rightly, this one was airconditioned & you can just see the controls for it on the left side of the picture, under the dash. This dash looks excellent, makes me want to go get a B210 (I also very much dislike the "square instruments" dash). And it looks like every option is there: a/c, rear defrost, and who knows what else. The steering wheel is a design departure from the previous two designs, but not, in my view, an improvement. I have seen Z round gauges in the internet...perhaps this can be re created with Z gauges. Since the Z gauges come with the oval case, perhaps it would not be that difficult. Some creativity, yes.It would add a lot to the B210's look. The square gauges are not that in tune with a performance look. I would favour getting an original round cluster....when I get my next B210 I will get into it.